"Three of the civilised and handsome Weymann-bodied 56-seat AEC Regents, mentioned by Chris, went in 1947 to fellow Red & White company Venture of Basingstoke, passing in 1951 to Wilts & Dorset. They were DG 9819 (No. 2) and DG 9820 (No. 3) of 1934, and BAD 30 (No. 10) of 1936. I remember seeing them (and secretly clambering aboard them in the AWRE Aldermaston bus park in 1955-56)." Above are two photos of No.2, firstly looking immaculate with Cheltenham & District on 23rd May 1939 and then, about 1952, as ex-Venture 91, looking a little careworn on a filthy day, after Wilts & Dorset had taken over Venture. 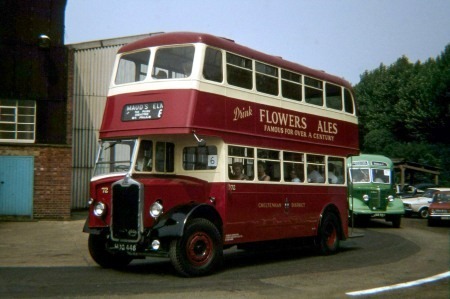 This later-life picture of DG 9818 brings back not only happy memories of AWRE Aldermaston bus park in the 50s, but also a question that has niggled me for years. I was never content with bus-spotting from outside and was always curious about staircases and upstairs seating layout. I very distinctly recall a decker whose staircase started in the usual way–three or four steps rising towards the offside rear corner–but then instead of turning to rise forward, it made a 180-degree turn to debouch upstairs facing the nearside. The two forward-facing seats opposite the top step were only singles. I don’t remember any incursion downstairs: the whole staircase fitted into the platform-well. My admittedly fallible memory recalls this bus as one of the Cheltenham trio, but when I asked a retired Cheltenham driver about it sixteen years ago he could recall no such layout; nor could Colin Martin, author of Cheltenham’s Trams and Early Buses (Tempus 2001) and other authoritative bus books. I’ve studied hard the photos of the DGs and BADs in Colin’s books and in Venture Limited by Birmingham and Pearce (1995) and in Wilts and Dorset, by Colin Morris and Andrew Waller (Hobnob 2006) and can see nothing that suggests what I recall. The DGs had only 24 seats downstairs and the BADs 26, but they all seated 30 upstairs, so there again there’s nothing to back me up. I begin to wonder whether the bus that I recall so clearly wasn’t an ex-Cheltenham after all, but then whose was it? All the E. Yorkshire Beverley Bar buses I’ve clambered around on seem to have had conventional stairs but with Roe-type square top steps. Can anyone disentangle me? Thanks! And thanks, Chris H, for the pictures. These three AECs which went to Venture as nos 85, 88 and 91 all had Gardner engines on arrival at Venture. The front bulkhead downstairs had a large rectangular panel (with round corners) protruding into the lower saloon above the flywheel cover – presumably because the Gardner 6LW took up more room than the standard AEC. They sounded rather like tractors compared with the usual Venture AECs. The staircases did indeed turn through 180 degrees and the top step protruded into the lower saloon above the off-side sideways seat next to the staircase: it was rather oval-shaped and a good example of the metalworker’s art as despite the many footsteps no dents or bumps were visible. It was just large enough for a footstep. There was no danger of a passenger bumping a head as upon standing up the body was clear of the intrusion. As a kid I remember traveling to school on these old AEC Regents. One of the features of the Weymann coachwork was access to the destination blinds on the top deck by undoing two latches thus enabling one to alter the route number. As some of the stops were shared by more than one route such action caused some concern to passengers and did not last very long as astute conductors would remove us guilty or otherwise. Somehow I managed to miss Michael Peacock and Deryck’s comments on the Cheltenham Regents that ended their careers with Wilts and Dorset, and have only just read them! It’s a relief to know that my recollection of the odd staircase wasn’t mistaken after all. I think this arrangement must have been a Balfour Beatty speciality, as it’s shared by the 1949 Notts and Derby BUT/Weymann H32/26R trolleybus at the West of England collection at Winkleigh, Devon, which I saw only two months ago. Given the above-average upper deck seating capacity, the nearly-180-degree staircase was obviously space-thrifty. Belated thanks to Michael and Deryck for shedding more light on these fascinating vehicles. 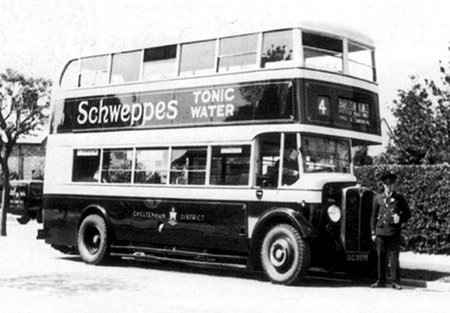 Cheltenham District was never quite the public transport company it seemed. Always privately owned until the late ‘40’s, it always appeared to be a municipal operation, compounded by the town crest its vehicles always bore on the sides. In tramway days, a sprinkling of Guy BB’s supplemented its tram services, but, with tram abandonment, it ordered 11 Guy Invincible double-deckers with open staircases and open tops. This degree of discomfort as late as the end of 1929! Worse was to come, for many of them were rebodied in 1937, still with open tops, but the dubious improvement of enclosed staircases! The war prolonged their existence, their not finally expiring until 1944. Uniquely, it’s likely that the wartime austerity Guy Arab’s came as a welcome breath of undreamt luxury to passengers and crew alike! To be fair, some civilised transport in the form of AEC Regents with handsome enclosed-top Weymann bodies had augmented the Guy fleet when delivered in the 1934-38 period. In May 1939, Balfour Beatty, owners since 1914, sold out to locally-based Red & White Group, which had favoured Albion vehicles long before the war. The first for Cheltenham were 6 new Venturer CX19/Weymann’s in 1940. 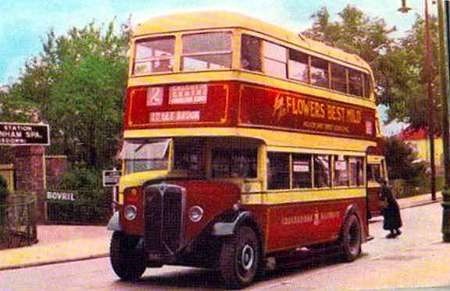 Preserved 72/HDG448, shown here, has an MCW body and was one of 6 delivered in March 1948, being withdrawn in November 1963. The bus now resides at Wythall bus museum, mechanically sound, but needing body treatment. 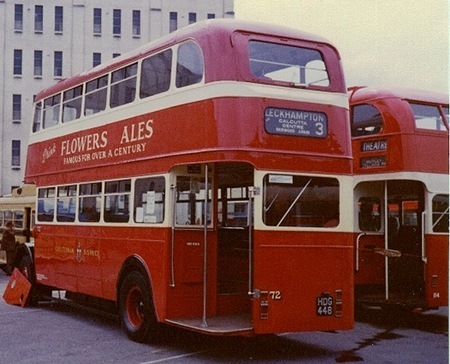 These photos were taken in happier days at the Bristol Bus Rally in 1977. Cheltenham District, as part of the Stagecoach group, still ploughs its own furrow, having lettered routes rather than numbered ones! The Flowers Ales advert’s a reminder that this Cheltenham brewery used tongue-twisting Stanley Unwin to make a series of TV commercials. Who recalls the catchphrase, “For the best keggy of the brewflade, Flowers.” Oh, deep joy! Doesn’t she look good in that resplendent paintwork! I suppose it’s not surprising that she looks a little faded now, 33 years later, but she’s under cover and secure at BaMMoT, where Malcolm Keeley assures me that all in good time the body will be assessed and repaired/rebuilt as necessary, which may well be a quite a pricey project. Three of the civilised and handsome Weymann-bodied 56-seat AEC Regents mentioned by Chris went in 1947 to fellow Red & White company Venture of Basingstoke, passing in 1951 to Wilts & Dorset. They were DG 9819 and DG 9820 of 1934, and BAD 30 of 1936. 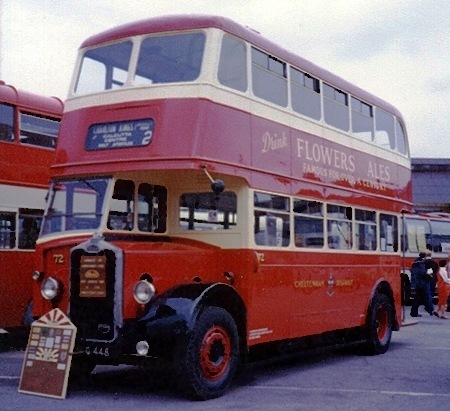 I remember seeing them (and secretly clambering aboard them in the AWRE Aldermaston bus park in 1955-56, where you could also see ex-Leicester Corporation Titans of about 1936 and pre-war Birmingham Daimlers. It was a very attractive livery, probably my joint favourite with City of Oxford colours. I liked the way the light paintwork was carried under the canopy, redolent of LGOC/London Transport LT and ST class paintwork before the war. One little aside about the 1940 Albions I mentioned above; two of them, 32 and 33, were delivered with sliding roofs, most unusual. And at AWRE, I wonder if Ian ever saw any of the many ex-London Transport Northern Counties-bodied austerity Guy Arabs they bought. I think that someone had given AWRE the nod that these had metal-framed bodies and would last longer than those framed with ‘green’ wood of uncertain type! What type is the bus next to it, I remember long bench seats and the passageway on the right hand side of the upstairs, what type of bus was this? I’ve looked at the the batch of photos I took that day, but a better one of the bus you mention does not exist. 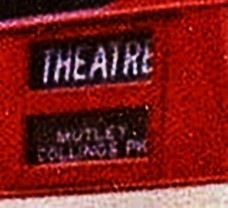 The original of the above photo shows the top side blind showing THEATRE, but I can’t read the lower one. It’s certainly not an LT RLH. Good surmise, Chris Hough. My original photo shows clearly, with the aid of a magnifying glass (shades of 221b Baker Street! ), fleet number 114 to the right of the platform! The top word on the lower side blind is undoubtedly Mutley, and that is Plymouth. During the war Cheltenham District had a centre staircase bus that the crews disliked; because if you missed a step, you ended up on your bottom on the pavement, it was centred doored with the stairs straight up to a higher platform from which you turned left or right to the top deck by a another 3 steps, It lasted about a year before being sent to Newbury, It appears that it never stayed at depot long. I believe it started its life up north, before making its way round Red & White depots. 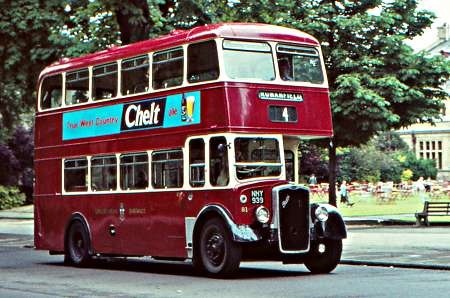 The Brush-bodied centre-entrance AEC running in Cheltenham mentioned by Mike 9 must have been ex-Burnley Corporation Transport no.49, reg. HG 1221, which became no.61 in the Cheltenham fleet, lasting there only only 8 months, till March 46. Apparently it sparked controversy even in the local press, as recorded on p.35 of Colin Martin’s "Cheltenham’s Buses 1939-1980". Newbury & District must have liked it better, keeping it for a whole 16 months. Although I never saw this fearsome beast, I did have a wonderful childhood ride on a Roe-bodied sister ship, HG 1023, Venture no.76 (ex BCT no.37) from Aldermaston Station to the village. As it swung round the corner and into view I wondered why an AEC should sound like a Leyland. At home in Reading almost all our AECs were oilers and the Leylands were all petrol, so I couldn’t make sense of a petrol AEC. Once aboard Mum forbade us from mounting the extraordinary sprouting staircase, so my sister and I had to make do with one of the higgledy-piggledy seats down below, where you could at least enjoy the music of the snuffly engine and chiming gearbox to the full. Pity the ride was so short! HG 1023 stayed with Venture until 1950. I’m grateful to Peter Gould’s BCT website, Paul Lacey’s 1987 N&D book and Peter Birmingham and John Pearce’s "Venture Limited" for numbers and dates. It was (and the current company is, although it’s not the same company) the Cheltenham District Traction Company (no ‘and’). However, just to confuse the issue, in tramway days it was the Cheltenham and District Light Railway Company. Thanks to Richard L for the link to that wonderful video (and even more importantly audio) of Albion Valiant TWY 8. The long climbs bring out to the gearbox at its best, and there are enough steady-speed sections to be able to hear the intervals clearly, which sound to me like a minor third in 3rd and a minor sixth in second. We hear only a snippet of first, so I won’t hazard a guess. I’ve never ridden on a prewar heavy Albion, but I’ve read that the gearbox had a much more subdued wail, just as earlier Guy Arabs only hinted at the incomparable wail that was to come with the Arab IV, sounds of which can be found on the Lancashire United Running Day from Manchester video on YouTube. The Upper Deck Cream paint did not extend down as far as the second row of beading on the coachwork; but ended at the bead line below the upper deck windows. 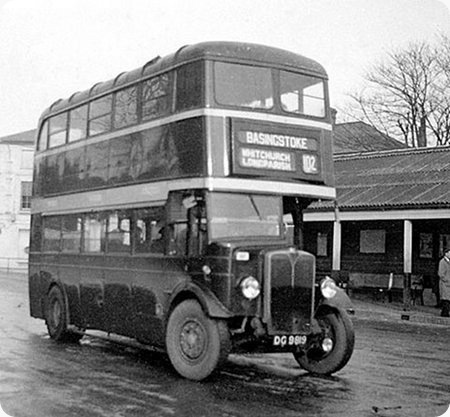 "Cheltenham’s Buses 1939-1980," by Colin Martin. Following on from Dave M, I recollect Cheltenham and District as being more maroon than red. Is the lighter colour on No.72 a livery from an earlier era? I remember often travelling on both DG 9820 and BAD 30 on the route 1 to Bramley when they were with Venture. I don’t remember anything odd about the staircase though. BAD 30 had no rear number plate – the reg. no. was painted on the back window. At least one of them had an "OIL ENGINE" badge on the radiator. For whatever reason, these two deckers stick in my mind. Rather late in the day for this thread, but in response to Peter Cook’s comment, this photo shows what I remember to be the standard (maroon) CDT livery in BOC days looking resplendent on The Promenade on June 21, 1964, recently out of the paintshop (in Bristol?) and probably converted to four-track route number blind beforehand (What overkill!!). In response to Geoff Pullin’s comment about Cheltenham livery, this photo taken in 1979 (Derby Open Day) shows that 72 was definitely in the maroon livery. I am sure that the colour in Chris’s views is simply down to photographic ageing. You can’t tell the difference between the Chelteham ‘red’ and the red of the neighbouring Plymouth bus, but different they certainly were. Looking at my own colour views of Bristol Ks in Cheltenham, in 1972, there are two distinct livery variations. One is the maroon of Geoff’s picture, although with maroon mudguards, not black, the other variant being a brighter red (not I think Tilling red) with mudguards in the maroon. I looked at the first comment in the tread which said body restoration would occur at some point. Well 6 years on and no movement and maybe none likely in the near future. Flowers Brewery was in Stratford-upon-Avon, by the way. The Cheltenham Brewery was West Country Breweries (Cheltenham & Hereford before that). Alan Murray-Rust queries the photo colours of the bus that I took in 1977. However,, despite the years in between, they do not appear that much different from what I remember. I’ve also looked at other photos I took of the other vehicles there that day and they seem to be accurate, having not deteriorated. To look in more detail, it is quite clear that the roof in my photo is maroon rather than the red elsewhere. 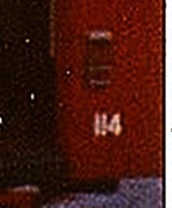 In his photo, both bodywork and roof appear maroon. Also, the Flowers advert in my photo is exactly the same shade as the bodywork it is painted on. In his photo, the poster background colour doesn’t seem quite the colour as the bodywork. So was the vehicle repainted in the interim?